11:27 I have often said "Chaos follows dullness." the opposite is also true-"Dullness follows chaos." 10:30 24.5 points in one chaotic move - definitely not a dull Friday ! Last few Fridays have been dull, suggesting going for smaller than normal gains; Today's Moontides suggest dull day, too. 8/8/2008 12:12:11 PM Mountain cgm:: market profile stuff suggests close around 79? 8/8/2008 11:27:01 AM Mountain cgm:: 7.5 break w/o taking out wed. h sets up the "lindenberg wiggle"
8/8/2008 10:18:40 AM Mountain DBJ:: Very early, but bought 85. 8/8/2008 9:07:49 AM Mountain rgh:: Al,is the planetary degree scaling different on the Rainbow chart? 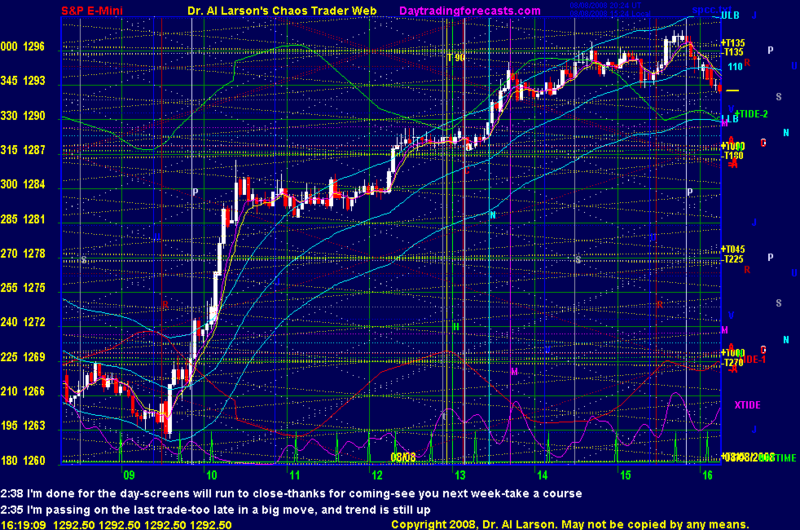 8/8/2008 6:48:19 AM Mountain DBJ:: GM All, and good trading.